SPOILER ALERT: This post links to tweets and other media that talk about unreleased content from Captain Marvel, Dumbo, Aladdin, Avengers: Endgame (crossed off because footage was screened at CinemaCon on April 3), Toy Story 4, Maleficent: Mistress of Evil, Lion King, Frozen 2, and Star Wars: Episode IX . I’ll cross off titles as the content that I describe is released (even if the film has not). You’ve been warned! Hi, I’m Scott Ladewig, you may remember me from such places as Wired, Nerdist, and HotNewHipHop. I’m also a “true American Hero” as well as a Hero of the Resistance. It’s true. All of it. 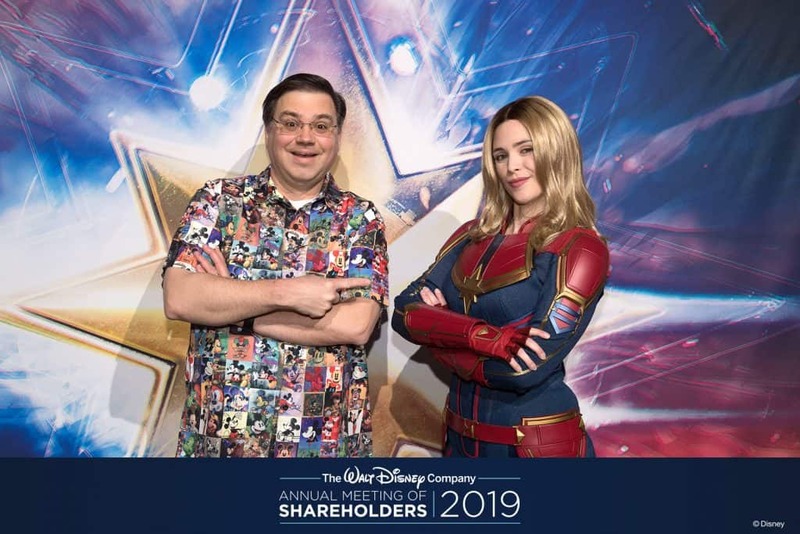 Yes, I was Internet famous for a bit all thanks to Robert Iger and the 2019 Disney shareholders meeting. Every March, The Walt Disney Company holds its annual shareholders meeting. While most companies hold their meetings in the same location each year, Disney moves its meeting to different cities. Occasionally they bring the event to the Midwest. For example, the meeting was in Kansas City in 2012 and Chicago in 2016. This year, Bob brought the show right to St. Louis. And when I say show, it really is more show than meeting. Disney covers all the bases with a review of the year’s financials, the election of the board, and so on. But they up the fun factor by bringing characters for photo opportunities and showing sneak peeks at what the company is up to, including new movie releases. And that’s how I became Internet famous. I am a Disney shareholder, so I try to go to the meeting whenever it is in the Midwest. In addition to the activities I mentioned above, Disney D23 usually holds a member event after the meetings, so I try to go when I can. I was at both the Kansas City and Chicago meetings. With the meeting here in my backyard, I took the day off and headed downtown. I arrived at the meeting with my ticket (you have to register in advance), and after clearing security and getting scanned in, the first stop was the phone check-in table. Because Disney is showing video clips that haven’t been publicly released yet, photography and recording is strictly prohibited. They make you turn off your devices and put them in locking bags to make sure temptation doesn’t get the better of you. 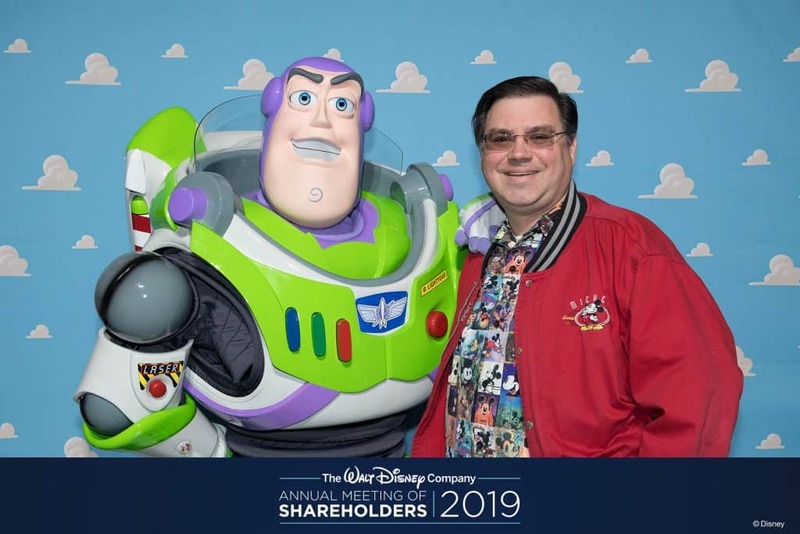 Once my phone was safely tucked away, I made the rounds of the photo stations and saw Buzz Lightyear, Woody, Captain Marvel, and Mickey Mouse (of course). 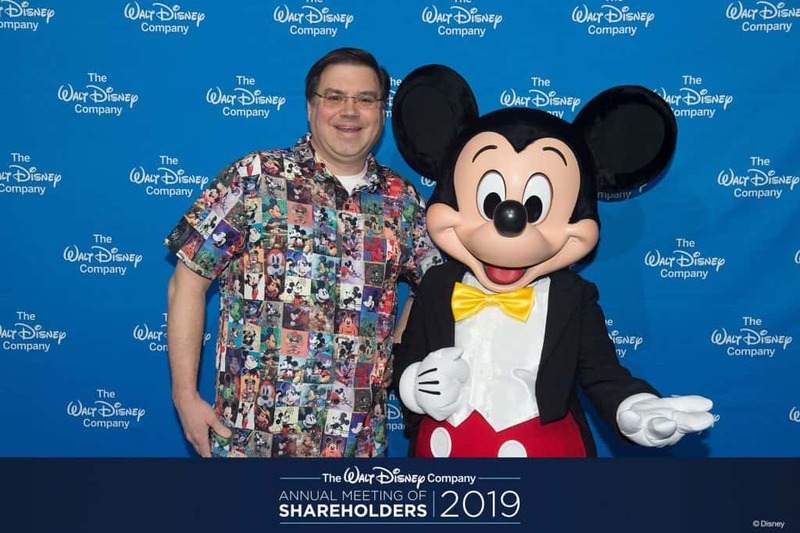 I wore a new Mickey Mouse 90th birthday Aloha shirt to the meeting and Mickey loved it of course. I saw a few of the Disney D23 gang such as Michael Vargo and Tyler Slater and chatted with them briefly before finding a seat. In the theatre, they directed those of us with questions for the Q&A to sit in a section near the microphones. I settled in to wait for the show to start. If you are interested, you can listen to the shareholders meeting audio and read the transcript of the meeting courtesy of the Walt Disney Company Investor Relations website. The meeting opened with a performance by DCappella, Disney’s new a cappella group. They were in town for a concert the next night. I went to the show and highly recommend them if you enjoy Disney music. They performed four selections (Friend Like Me, Part of Your Whole New World mashup, The Glory Days from Incredibles 2, and I Wanna Be Like You). After they finished their set, the room went dark for the sizzle reel. Each meeting starts with the sizzle reel (also known as a highlight reel), which shows clips of everything Disney is doing. And that’s a lot! They show scenes from the parks, the resorts, the cruise ships, their TV shows, their movies, and move. It’s a great way to get everybody pumped up and excited for the day. The clips in the sizzle reel go by quickly, and it can be overwhelming trying to take it all in. And I was giving it my best shot, hoping for new footage from new movies such as Avengers: Endgame and Star Wars: Episode IX. And boy did Disney deliver. For Avengers they showed some footage from the trailers that had already been released. For Episode IX, however, this was the first time any footage had been shown to the public. Oh, to have had my phone at that moment! After the sizzle reel was done, Bob Iger came out to run through the meeting. 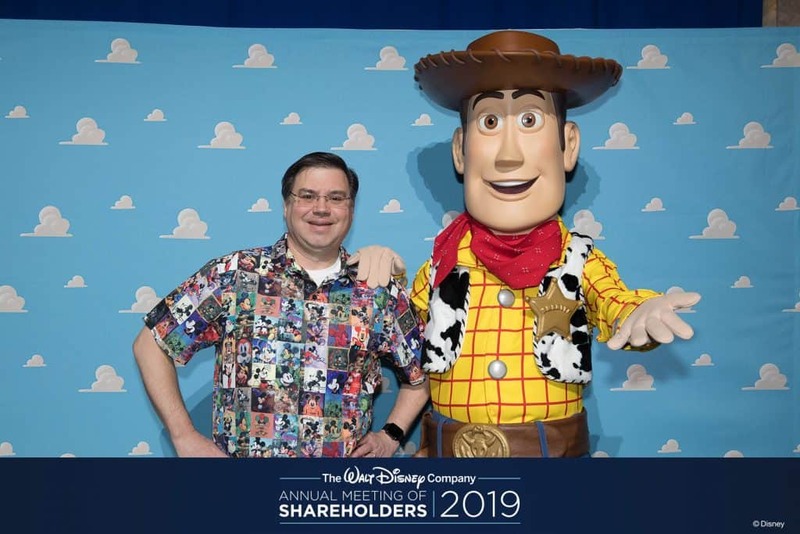 I won’t bore you with the business portion of the meeting, but I will note that over the last ten years, Disney’s total shareholder return was 732% as compared to 400% for the S&P 500 over the same period. Not bad. After the business portion of the meeting was completed, we finally got back to the good stuff. Bob talked about ESPN+ as well as the upcoming Disney+ streaming service. (I’m signing up for that day one.) He then talked about Galaxy’s Edge, surprising everyone with opening dates earlier than expected. As you probably already know, Galaxy’s Edge opens at Disneyland on May 31 and at Disney World on August 29. We also learned that they will be opening in phases; Smuggler’s Run at opening, with Rise of the Resistance coming later. They showed us a video tour of Galaxy’s Edge at Disneyland from the perspective of someone walking around the land. There weren’t any signs of construction in the areas they showed us, and it was completely empty of people (that’ll be the last time we see it like that). It looked amazing. It looked like. well, Star Wars of course. If I didn’t know better, I would have thought we were watching an actual Star Wars movie. There was one part in the video, where you’re in a building at the spaceport looking out the windows down onto the Millennium Falcon. Unbelievable. I’ll be at Disneyland in August and Disney World in November, so I’m going to have a chance to see both lands in the first year, and I can’t wait. We heard a bit more about the parks and what’s coming such as the new TRON Lightcycle coaster (something else I can’t wait to ride) coming to Magic Kingdom, as well as the new cruise ships (still unnamed) and the new private island at Lighthouse Point in the Bahamas. And then it was on the movies. 2019 is a big year for Disney with Captain Marvel, Dumbo, Aladdin, Avengers: Endgame, Toy Story 4, Maleficent: Mistress of Evil, Lion King, Frozen 2, and Star Wars: Episode IX all coming out. And we saw content for all of them. Aside from the Frozen 2 trailer, which was shown on the big screen for the first time that day, everything else was being shown to the public for the first time. We saw trailers for Aladdin and Toy Story 4, a scene each from both The Lion King (unfinished but still spectacular) and Avengers: Endgame, as well as an overview and clips from Maleficent: Mistress of Evil. And then there was… Star Wars: Episode IX. Bob announced that they had just started editing Episode IX, so they didn’t have a lot to show (other than the bits and pieces in the sizzle reel), but J.J> put together a behind-the-scenes video to show. (It’s a safe bet that this will be shown at Star Wars Celebration in Chicago as well.) I tried to remember as much as I could, but like the earlier footage, we didn’t get to linger on anything. Bob was not hitting pause and rewind to make it easier for me. It was then time for shareholder questions, but they cut off questions before it was my turn. I was going to ask Bob whether there were any areas at Walt Disney World that he saw as needing investment beyond what we’ve already heard about, such as the big Epcot reimaging, TRON, and Galaxy’s Edge. As time was getting short, I changed gears and was going to make a request for TRON 3 and an Epcot 40th music box set, but I never had my chance. Star Wars! Avengers! Galaxy's Edge! It's all so awesome! Seriously though, the shareholders meetings are always a blast! And that’s when things went crazy. As I left the building, I noticed that my tweets were starting to get a lot of likes, retweets, and questions. I wanted to start dumping more details of what I saw, but time was short, and it was cold outside. I hustled over to the Midwestern Meat & Drink (highly recommended if you’re in downtown St. Louis), ordered lunch, and then proceeded to do a brain dump of everything I could remember while trying to avoid getting sausage gravy on my phone. I described scenes and answered questions all the way through lunch including typos and some mix-ups on ship names. I kept tweeting on the way back to the theatre and before Captain Marvel started, finally taking a break for the movie (which was great!). After the movie ended, my twitter account was still blowing up, so I picked up where I left off. By the time the day ended, my 99 tweets for the day generated over 600,000 impressions (!!!). To compare, a typical day for me rarely exceed 10,000 impressions. I truly didn’t expect to get that much of a response, but I was the only one sharing extensive details online about the meeting. My friend @DizParks was tweeting some (and serving as my second source when I wasn’t sure whether my memory was correct), and Matthew Hansen from Utah was also sharing some details. But for whatever reason, all eyes were on my tweets. Some of this was thanks to @Sleemo_ on Twitter who really amplified me to the Star Wars community. I shouldn’t have been surprised, I guess. When you add two of the most eagerly awaited films (both of which close out years of storytelling), passionate fan communities, and a dearth of news in public, it’s a pretty flammable combination. It was a powder keg, and I was the only person holding a match. I was also a guest on the Tatooine Sons podcast, and a topic of discussion on several others such as Scavenger’s Hoard (thanks Rachael and Kirsty!) and Followers of the Force. I also started hearing from friends who were seeing me get mentioned in other places such as Nerdist, Slashfilm, and more. Sure enough, there was my smiling face. That’s me! 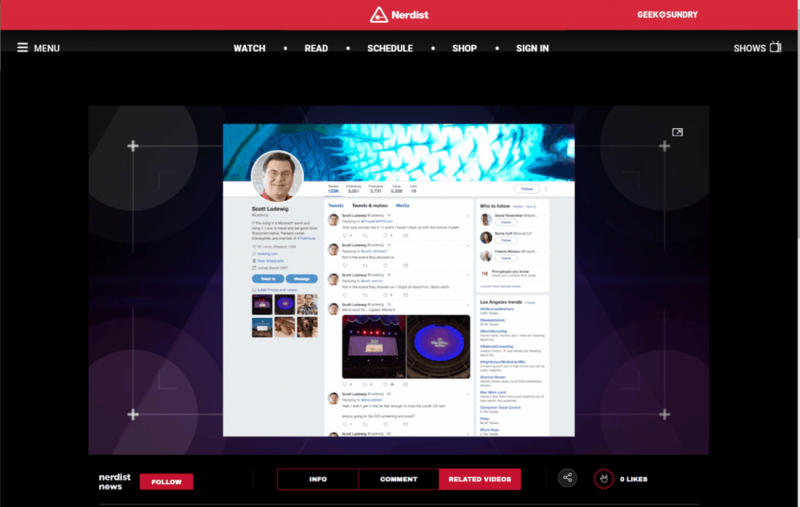 On Nerdist News! I started making a list (because that’s what one does when they become internet famous), and wound up with ~120 different podcasts, videos, blog posts, news articles, and even Reddit threads. Foreign sites picked it up including the UK, Germany, France, Italy, Russia, Greece, China, Vietnam, Mexico, and more. I’ll post a link to everything for those who are so inclined. I even picked up some fans of my own, especially amongst the Reylo fans. you're the hero we needed, thanks! Some fans were worried that I was going to get in trouble for sharing the details of what I saw. Things started to quiet down after the first week, with the number of impressions going down each day. There was a big boost on March 14 when the Avengers: Endgame trailer was released. I was glad to see that part of what I described a week earlier had made it into the trailer. Vindication! This helped convince some folks that I really did see what I had described. I found it surprising that some people actually thought I might be lying about it. Especially the people in one forum I found that insisted I was “fake news” and the “fakest leak ever”. Five minutes online, and it’s pretty obvious that I’m a real person. What kind of person would lie about what they saw to two passionate fan bases? It’d be online suicide. Here is the view of the last few weeks courtesy of Twitter Analytics. I went from under 10,000 impressions per day up to 600,000 impressions that first day. Even as the daily number declined, I still managed to rack up 3.5 million impressions which isn’t too bad. If only I had something to promote while all of those eyes were on me. My follower count also received a boost, to the tune of 941 people. I went from 3,557 to 4,498. I expect to lose some folks when they realize that I don’t have any more juicy info to share about their favorite movies. But who knows, maybe they will stick around for my usual nonsense about Disney, Microsoft, Tiki, and Travel. Trailers for Aladdin, Toy Story 4, and Avengers: Endgame have all debuted proving that I was on the level. Star Wars Celebration takes place in Chicago in a couple of weeks, and I expect the fans there will finally see the footage I described. It’s possible that some of what I saw won’t be revealed until the movie is released in December, but enough will that I won’t be the man of the hour anymore. I wish I was going to be in Chicago for Star Wars Celebration to see the footage drop. We decided to skip it this year because we’re going to Disney D23 Expo in August. It seemed to be a bit much to do both. If only I knew then, what I know now. We should still get some Star Wars news at Expo, and hopefully some of the cast will be in attendance. It just won’t be ground zero for Star Wars like Chicago will be. I know some of the people I’ve met on Twitter since this all began will be in Anaheim though, so it will be fun to meet up. This post ran a bit long (as mine often do, sorry), but I hope you enjoyed the story of my 15 minutes 3 weeks of internet fame. Until next time, here are links to some of my Twitter threads with reveals from the meeting along with a pointer to links to all of the media coverage I received. Enjoy! There are too many links to list here, so I added a page that contains everything.